The Central, 1916 building embodies distinguishing characteristics of the Spanish Colonial Revival style with classical Renaissance details that are important to the City's character. The 1930 Faulkner Gallery exemplifies the once nationally popular Art Deco style characterized by its smooth, stucco wall surfaces, linear symmetry and stylized geometric entrance. 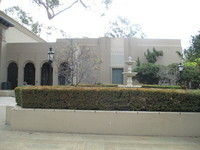 The Art Deco Faulkner Gallery is one of the best remaining examples of Art Deco architecture in Santa Barbara. Distinguished architects; Henry Hornsbostel, Francis W. Wilson, Carleton Monroe Winslow, and Myron Hunt contributed to the design and creation of the Central Library. Their noted design efforts significantly influenced the heritage of the City, State, and Nation. 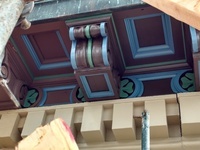 The Central Library building has skillfully carved wood brackets under the eaves and carved wood windows. The intricately carved sculpture over the main entrance door demonstrates outstanding attention to detail and craftmanship. The Faulkner Gallery's linear, Art Deco entrance with its stylized sunburst demonstates outstanding attention to architectural design. The complex sits in its central location in the downtown neighborhood and El Pueblo Viejo Landmark District. It has dominated the highly visible corner of Anapamu and Anacapa Streets since 1916. It is an established and familiar visual feature of the neighborhood. 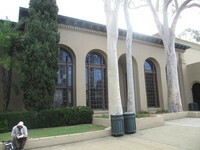 The approximately eighty-year-old Corymbia (Eucalyptus) citriodora trees tower over the Central Library and are an established and familiar visual feature of the neighborhood and El Pueblo Viejo Landmark District. Until recently considered a species in the Eucalyptus genus, Corymbia citriodora has been widely planted in southern California for over a century. An evergreen from Australia, it is one of the most statuesque trees on the skyline, and has been a favorite of landscape designers due to its lemony fragrance, drought tolerance, fast growth, and singular beauty, expressed by its smooth trunk and graceful silhouette. Designated City of Santa Barbara Landmark (10/23/2012). - Its exemplification of the best remaining architectural type in a neighborhood. As a Carnegie Library, the Central Library represents the impact of the Carnegie Library grant program had on providing access to knowledge for people of all incomes across the Nation. 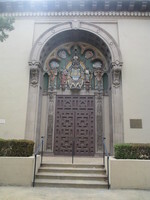 It is a significant part of the heritage of Santa Barbara, California, and the Nation. -	Its integrity as a natural environment that strongly contributes to the well-being of the people of the City, the State, or the Nation. According to The Secretary of the Interior's Standards for the Treatment of Historic Properties with Guidelines for the Treatment of Cultural Landscapes, the trees are character-defining features of a historic design landscape. Although the landscape has been altered, the trees remain. They are significant skyline elements, integral to the landscape of the current Library campus and to the landscape of the surrounding neighborhood. The evidence strongly supports that they are original to the design prepared by Ralph Stevens, a Santa Barbara native who became a nationally-significant figure in early- and mid-Twentieth Century landscape design. 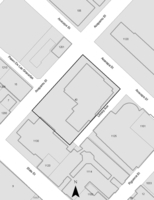 While a landscape plan by Stevens could not be found, evidence of the authorship of the design is provided by a 2010 article by Michael Redmon based on a Stevens' obituary and by a letter from Kellam de Forest, (the son of landscape architect Lockwood de Forest III, also known as Lockwood de Forest, Jr.), dated February 19, 2012. 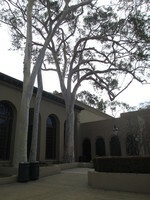 The inclusion of the lemon-scented gum trees in the original landscape design is supported by an architectural rendering of the Faulkner Memorial Art Gallery (1929-30) by the architects Hunt & Chambers, showing the trees realistically depicted and accurately shown in their present locations. 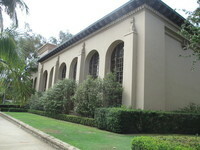 In addition, an undated plan prepared by H. V. Dobson, electrical engineer, depicting the three trees located on the Anapamu Street side of the Library, has been found in the City of Santa Barbara Archives. This plan indicates intended fixture locations and schematic wiring diagram for decorative lighting of the building and landscape. The plan shows the original layout of pavement, with the walkway on axis with the entrance to the Faulkner Wing, from Anapamu Street, and implies the trees are existing at the time. Based on the size of the trees, it is presumed that they were planted shortly after construction of the Faulkner Gallery, or around 1930.